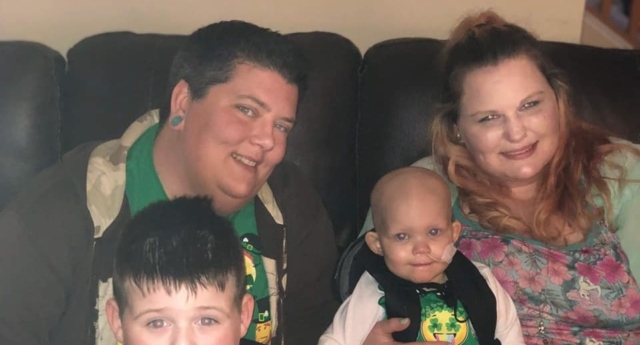 A lesbian couple who are fundraising for their daughter’s cancer treatment were horrified when they received a homophobic message from a would-be donor this week. Tiffany and Albree Shaffer—who are from Cincinnati, Ohio—are aiming to raise $20,000 after their daughter Callie was diagnosed with advanced neuroblastoma, a type of cancer. While many people have generously donated to the family’s campaign, one person said they had decided against offering them money. “My prayers for Callie,” the Facebook message began. “I was going to donate $7600.00 to her fund but I found out her parents are lesbian. I’ve chosen to donate to St. Jude due to that fact. In an interview with 16 WNDU, Albree said she was “disgusted” and “shocked” by the message. The comment comes after a difficult time for the family, who found out in January that Callie had cancer. On their GoFundMe page, Callie’s aunt, Trisha Lamb, said Callie is “high risk” and her cancer is at stage four. “She will need 18 months of chemotherapy and radiation treatment,” the page says. “She will need a bone marrow transplant, and also will need future surgery to remove the tumor once it shrinks. Albree has had to give up working to be with Callie in the hospital—where she is currently spending every day—and the funding drive is to help the family stay afloat during Callie’s sickness. In an update posted yesterday on their Facebook page, the family revealed that Callie recently underwent surgery and that doctors were able to remove 90 percent of her tumour. “Thank you all so much for the love, support and prayers!” the post said. The family are also selling personalised t-shirts as a part of their fundraising goal.